G4 Complete Entertainment, a brand-new premium family entertainment concept opened its first location in Utah, US, today operating on the Semnox Parafait venue management platform. 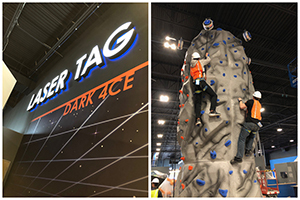 G4CE, with over 100,000sq.ft of entertainment, features multi-level laser tag, 10 lanes of premium bowling, go-karts, black light mini-golf, toddler bounce areas, virtual reality bays, simulators and exciting arcade games. Some of the features implemented include point-of-sale, self-service kiosks, Lumin-enabled RFID tap-to-play debit card systems for the arcade, redemption and inventory management, party reservation and loyalty management. Parafait cloud-based management and reporting, online party reservation, as well as several other online functions are also in the plan. The Lumin attraction readers are implemented to operate the attractions. “We spent a lot of time searching for the right solution for our needs the great thing about Semnox is that it provides management and functionality for all aspects of the centre in a single system. Their service and reliability have further added to our confidence that we made the correct decision. We are excited to have them as a partner to grow with.” said Paul Carr, vice president of business development, G4 Complete Entertainment.